I have been on a journey of self discovery for 3 decades now and have grown in my understanding of the ways of the world. I have especially become fascinated by the laws that govern our universe. I am currently doing research for a book that I am writing about the Law of Attraction. In particular, I am exploring how we can best utilize the tools and gifts that we were given when we embarked on our soul journey to live as human beings on Planet Earth. We are each presented with an infinite number of possible experiences. My book is about choosing and manifesting the experiences that serve the highest and best good for us as individuals and for the collective. I have always known that I wanted to become a coach and thanks to tumultuous events that unfolded in my life, I stepped onto that path about three years ago. Since then, I’ve been exploring the possibilities within the field – and loving every second of it. I quoted Margaret Mead’s words today because they have been resonating with me for quite some time now, and because it seems that I am being called to get involved with and take action on various humanitarian causes. I feel in my heart of hearts that I am being drawn towards speaking out for those who are either too young or unable to do so for themselves. Today, I would like to discuss a cause that I have recently become involved with. I want to build more awareness in our global society about an important issue so that we, collectively, can do something very worthwhile for those who are too young to speak for themselves. “Female Genital Mutilation” has been in my consciousness ever since I saw a movie called “Dessert Flower” several years ago. The movie is about Waris Dirie, who rose from a very traumatic experience during her childhood in Somalia, in which she was subjected to female genital mutilation (FGM), to become a famous fashion model and a human rights activist against the practice. As the universal law of attraction would have it, the thoughts and feelings that I experienced when I watched the movie were so intense that an opportunity presented itself to me so that I would write an article to help increase awareness about this barbaric ritual. It is crucial for you to get to learn about the beliefs of those who perform FGM and not pass any judgments. It is nothing but a lack of knowledge and the ignorance of those who don’t know any better. The above video sheds a lot of light on why it is done so that we can have compassion for both the victims and the unconscious adults who perform the circumcisions. What can we do to bring an end to FGM? First, I again stress the importance of education and of not passing judgment. Four years ago I was absolutely appalled and very judgmental. But, now I know that my anger and judgment fixes nothing and can even make matters worse. We must, instead, be respectful and send love and light to those people who were brought up in a culture that seems strange to us. Second, you can cast your vote for the young girls of Somalia by signing the “Stop FGM” petition here: causes.com. Also, please invite as many people to this cause as you can. Your vote empowered by the avalanche of others can really make a difference. Believe it and act upon it in the spirit of love! Third, set your intention on creating a world where FGM does not exist. 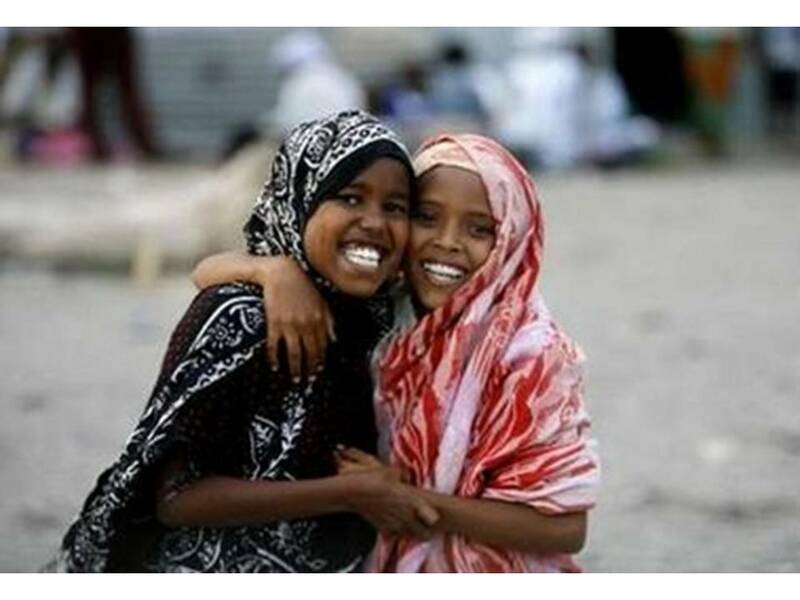 Visualize the young girls of Somalia as happy, healthy, and beautiful (see the image below) – with all the opportunities we have! And fourth, if you want to become even more involved, there many other organizations that are working to put an end to FGM. Simply search the net for the phrase “female genital mutilation” or “stop female genital mutilation.” Do your research and join in with others who are trying to make a positive difference in the world. Therefore, we must eliminate from our minds the notion that we must fight against or battle anything that we are against (including FGM). The mechanics of fear are so advanced in our society that our first reaction to a problem is often to lash out and attack. When I posted the “Stop female genital mutilation” cause on my FB wall, there was an avalanche of anger against those who perform the circumcisions. That was the last thing that I wanted to happen, because I know that the only real and lasting solution to any human rights problem can be found in compassion, love, and peaceful approach. I invite you start taking positive action on what you believe in. After you viewed the above video, I’m sure you will want to help effect a positive change and create a ripple effect with this one. 3 times per week to help you stay on the path of enlightenment and love. "Paths to a Healthy Heart"